These 8.5 x 11 inch posters, 100/package are in Spanish (for the English version, see CNPP-25). 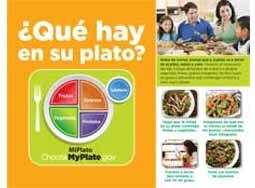 The front features colorful graphics and tips that help you follow the MyPlate program. A table on the back describes the five food groups and key points to consider, including portion sizes for a 2,000-calorie diet. It also provides reminders about cutting back on sodium and empty calories from solid fats and added sugars and physical exercise. This mini-poster is a great handout for audiences of all ages.